But the centenary of Shackleton’s departure also seemed an ideal time to publish an article on the Horniman Museum’s website about the Antarctic objects which the museum once owned. I’ve spent some time recently researching these objects – what they were, and where they are now – and the article goes into some detail about all this. I’ll write a bit about what they tell us about museum documentation in a few days’ time; at the moment, I’d like to talk a little about what they tell us about attitudes to the ‘Heroic Age’ of Antarctic exploration. Given to us by Lady Kennet, Captain Scott’s widow: a pipe, uniform button and pair of skis of Captain Scott’s, now at Discovery Point in Dundee. Given to us by a Miss Shackleton, who – Jonathan Shackleton kindly told me – must, from her address, have been one of Shackleton’s sisters, probably either either Gladys Mabelle or Amy, but possibly Alice: a photograph of Shackleton, transferred to the Scott Polar Research Institute (SPRI) but found to be mouldy and disposed of; a lifebuoy from Shackleton’s last ship, the Quest, sent to the Sea Rangers’ ship Quest in Aberdeen, now disappeared; and a wire circlet from the James Caird, which is currently untraceable. Given to us by C. T. Colbeck, son of William Colbeck: 14 quarter-plate and 5 half-plate photographs made by Colbeck, apparently during one of the Discovery Relief Expeditions, which he commanded, transferred to the SPRI; and four Adélie Penguin eggs and one Antarctic Skua egg, collected in Victoria Land during the first Discovery Relief Expedition. Of uncertain provenance, but possibly associated with Louis Bernacchi: a print after a drawing of sledge-hauling by E. A. Wilson, now in the SPRI, and possibly a second pair of skis. But these objects do open a small window on attitudes to the Heroic Age of Antarctic Exploration, about 15 years after it ended with Shackleton’s death on board the Quest, anchored off South Georgia, on 5 January 1922, and the consequent fizzling out of the Shackleton-Rowett Expedition. All the objects for which we know the provenance were collected at the same time: the Colbeck objects in January 1938, the Shackleton objects very soon afterwards, and the Scott objects in March 1938. 1938 was the year after the 25th anniversary of the deaths of Scott and his companions on their return from the South Pole, and Max Jones has shown that the anniversary sparked renewed interest in Scott’s last expedition. This would explain the Scott articles, whose acquisition seems to have been prompted by someone at the Horniman, writing to Lady Kennet to ask her for some mementoes of her late husband: we suspect it was the museum’s Curator (ie Director), L. W. G. Malcolm. Interestingly, both Shackleton and Colbeck had local connections with the Horniman Museum, which is situated in Forest Hill in south-east London: Shackleton’s family had moved to neighbouring Sydenham in the mid-1880s, his parents and sisters continued to live there during his lifetime, and Miss Shackleton was still living in Sydenham when she gave the museum its objects in 1938. And William Colbeck’s son, C. T. Colbeck, was living in Forest Hill when he donated his objects. So, it looks as though Malcolm, prompted either by the 25th anniversary of Captain Scott’s death or an initial gift from someone living close by the museum, began a collection of Antarctic objects. And these were not regarded as just any relics: the accession register lists the Colbeck material simply as ‘Antarctic relics’; and this is exactly the same language as the Horniman’s next Curator, Otto Samson, used in 1956 when he started disposing of the objects. We know from Samson’s correspondence that the objects were displayed in the museum’s South Hall (although, sadly, I’ve been unable to find them in any of the museum’s photographs of old South Hall displays). 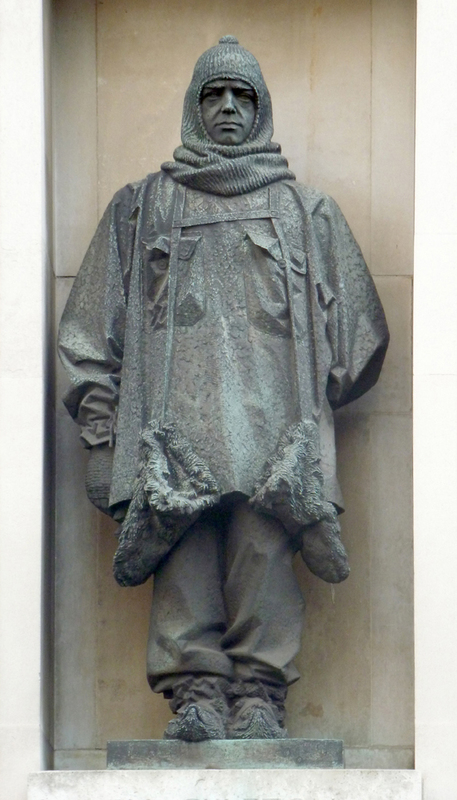 ‘Relics‘ carries overtones of sacred objects, physical remains associated with some sacred being, and I have a strong suspicion that, 25 years after Scott’s death, Malcolm built a small shrine in south-east London to the memory of Scott, Shackleton,and other local Antarctic explorers. Indeed, Samson later described them as ‘relics of a national hero’. I feel that these relics of a national hero would be more suitably housed at the Polar Research Institute at Cambridge or the Royal Geographical Society rather than in a museum devoted to Ethnography and Natural History. Whilst it is true that Antarctica, unlike every other continent, has no native human population, with all that a native population implies as material for ethnographic study, it could be argued that these objects represent the very beginnings of the material culture of a new continent. Whilst it’s impossible to know, it may also be that Samson, having fled the Nazi persecutions and lived through the Second World War, had a more questioning attitude to stories of heroic self-sacrifice than did Malcolm, who was of an earlier generation. Changing attitudes are also evident in two more Antarctic objects at the Horniman: the skulls of a Weddell and a Crabeater Seal, collected at some point in 1934 or 1935 by Bob Young, a member of Admiral Richard E. Byrd’s second Antarctic expedition and sold to the museum by his brother-in-law, W. Goodman Barnes, in 1936. There is no mention here of relics: these were acquired as scientific specimens; and they were collected during a new, mechanical, phase of Antarctic exploration: Byrd travelled with two ships, three aeroplanes, and six tracked tractors. But as we mark the centenary of Shackleton’s departure on his most famous expedition, perhaps we should think again about that collection of relics of local – and national – heroes in a museum in south-east London. In passing, my research for the Horniman article has also made me think about biographical resources. Despite his being one of the party of ten who were the first to over-winter on the Antarctic mainland in Carsten Borchgrevink’s British Antarctic Expedition of 1898-1900, and being chosen to lead both expeditions to relieve Captain Scott’s Discovery, trapped in the ice at the end of McMurdo Sound, there is no major published biography of William Colbeck; indeed he does not even merit an entry in the Dictionary of National Biography. Perhaps in contrast, I have found the biographical information about Bob Young, gathered together by his nephew Bruce Young, fascinating: Young – who trained as a Royal Navy diver, served at the Battle of Jutland, and worked in the USA, Canada, Ceylon and Australia before settling down to farm in New Zealand – was clearly a highly capable and mechanically skilled, if initially rather restless, man; and, as a member of the ‘lower deck’, with no clear role in Byrd’s expedition other than to provide general support and assistance, he is an unusual person to be the subject of a biography; though his biography is all the more welcome for precisely that reason. And I’d like very much to know more about the Horniman’s ‘caretaker’ Curator, L. W. G. Malcolm: after all, he ran the Museum for ten years, from 1937 until his death in 1947. Glad to see your comments about William Colbeck being rather neglected. You are wrong about him not being in the DNB. There is a (shortish) entry in the latest edition (available online) and he also has a Wikipedia entry, newly corrected with a photograph of him, as well as one of his son William Robinson Colbeck, who also went to Antarctica. He was living in Inchmery Road, Catford when he died in 1930 and is buried in Hither Green Cemetery. I am currently writing an article about him for the Lewisham Local History Journal. Sandra, thanks. I don’t know how I missed the DNB piece – http://www.oxforddnb.com/view/article/37300 – as I’m sure I checked it when pulling together information on Colbeck for the Horniman’s people authority. There are some useful sources in there which I didn’t know – I based myself on Savours’ Voyages of the Discovery, Borchgrevink’s First on the Antarctic Continent, and Scott’s Voyage of the Discovery. I’d still like to read Bernacchi’s account of the Southern Cross expedition, and Crawford, That First Antarctic Winter – and have you come across Don Aldridge, The Rescue of Captain Scott (Tuckwell Press: East Linton, 1999)? Do , please, let me know when your article appears: I’d love to read it. My brother, husband and I spent a few days in Hull in October, where there is interest in commemorating its Antarctic heroes with city plaques. I’m still hoping to get one up in Catford. Sandra, thanks for letting me know. I’ve just emailed Jonathan Derrick, and hope to be reading your piece soon!